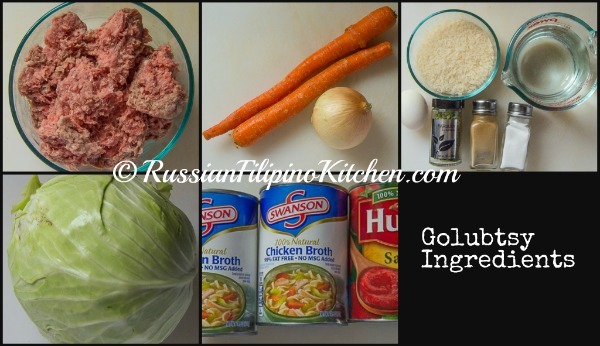 I first tried golubtsy from my mother-in-law a few years ago. 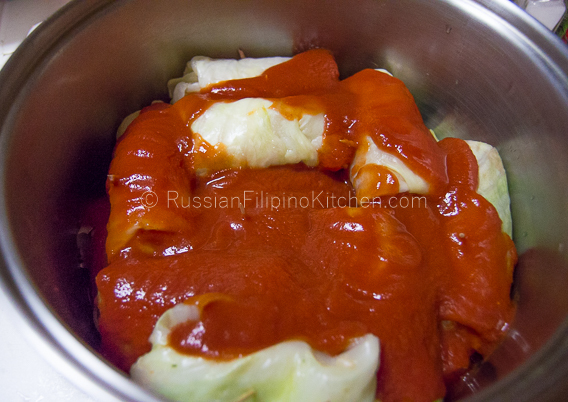 It’s a Russian dish made from rolled cabbage leaves filled with meat and rice simmered in water, tomato sauce, and some spices. I swear the first time I tried it, I was hooked. It was simply delicious! I was anemic during my first pregnancy and therefore had to increase my iron intake from food such as meat. My MIL’s weekend visits to our apartment made me happy since she often brought in iron-rich foods enough to last us a week. These visits excite me as well since she always had something “Russian” for me to try, either store-bought or something she cooked at home. 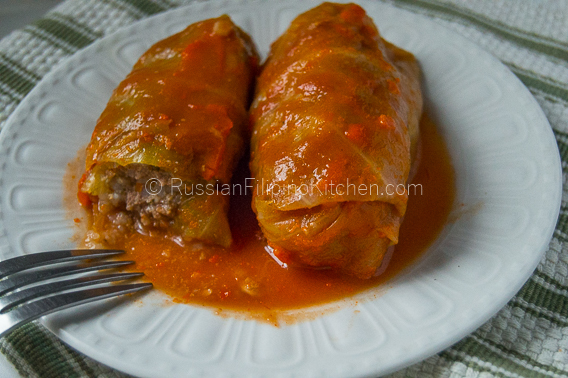 My favorites include marinated mushrooms, piroshki stuffed with pork, fried chicken liver, fish soup, and stuffed cabbage rolls. 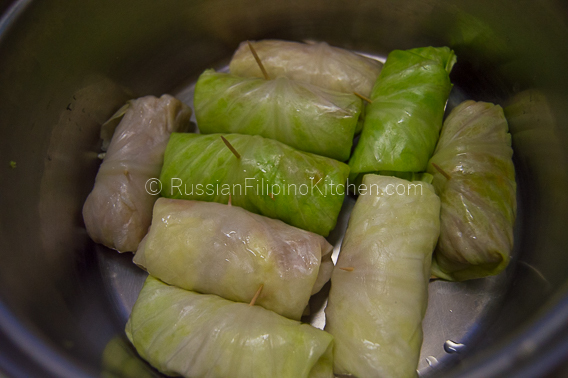 The cabbage rolls were good and something unique to me, so I decided to learn how to make it. Due to language barrier, I had to ask my husband to request his mom’s recipe, which thankfully, she gladly shared with us. 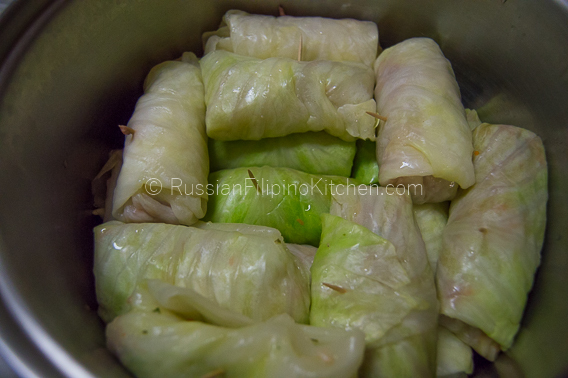 This golubtsy recipe has been modified a little bit to suit our taste by simmering the rolled cabbage in chicken broth instead of plain water. 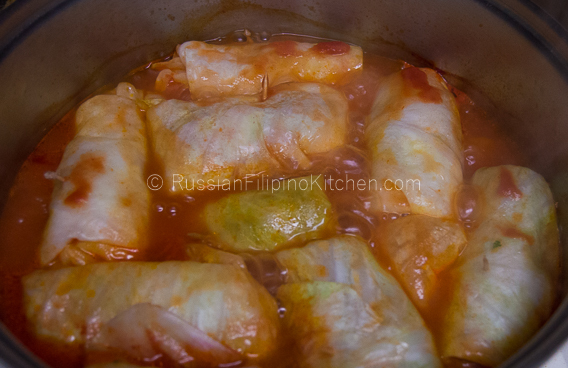 Since the first time hubby and I made it, it has become a family favorite, and one dish I regularly make for dinner. Try this for yourself. I promise this is very good, you will eat more than one roll. Also, it tastes much better after a day or two sitting in the fridge. You can eat it either warm or cold. 1. 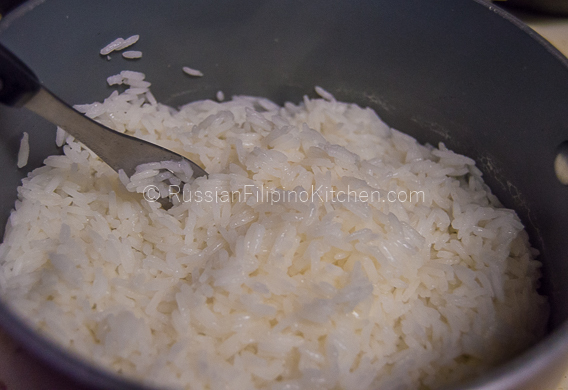 Add rice and water in a sauce pan. Set stove on high and bring to a boil. 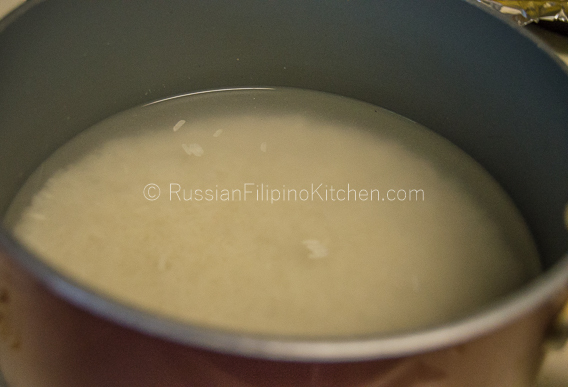 Lower heat to “low” and simmer with lid on until all the water has evaporated. 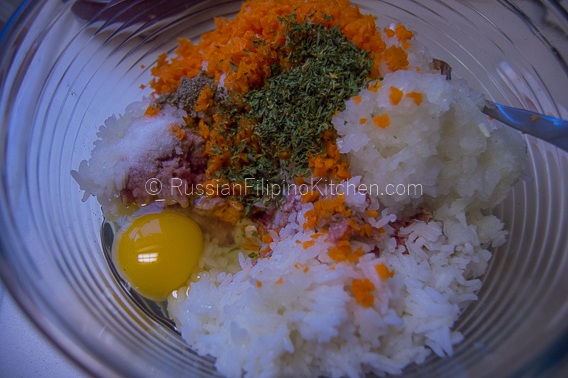 Remove from heat and fluff rice with a fork. Cover and set aside to cool. 2. 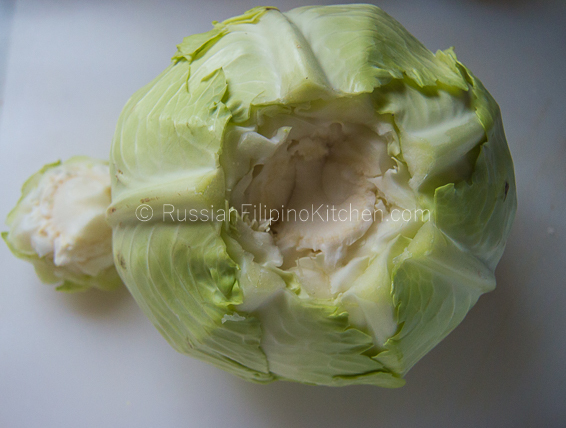 Wash cabbage with cold water to remove any surface dirt. 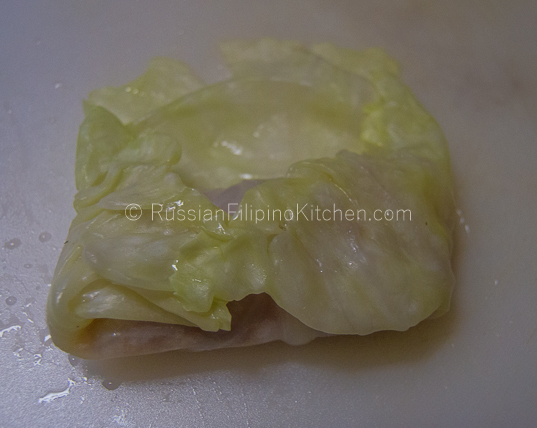 Remove the core with a knife and insert a regular dinner fork or carving fork (my preference) into the center of the cabbage. 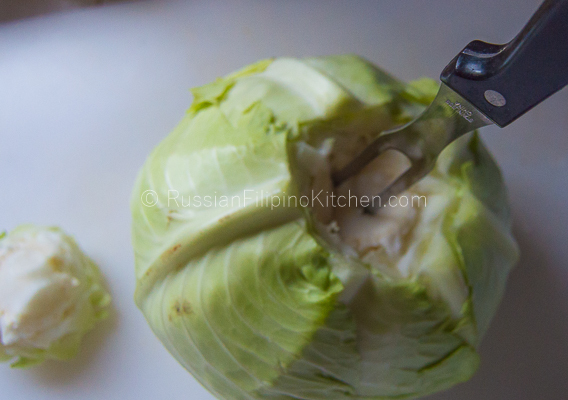 You will use this for gripping while you submerge the cabbage into a pot of hot water. 3. Fill a big pot with water, about ¾ full (I use hot water from the kitchen faucet to expedite the process) and set stove on medium high. 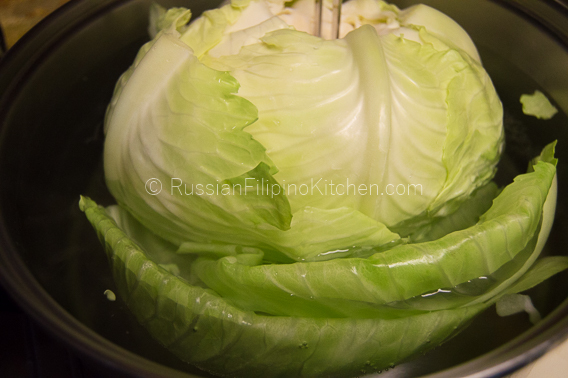 Submerge the cabbage when the water just starts heating up, but not boiling. 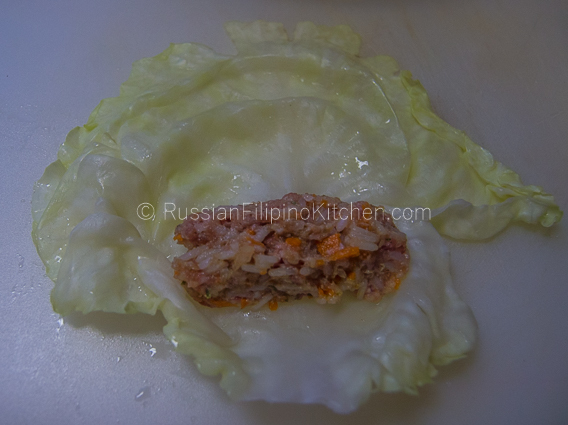 The purpose of this step is to loosen the cabbage leaves so they are soft enough to use as wrapper for the meat filling. 4. 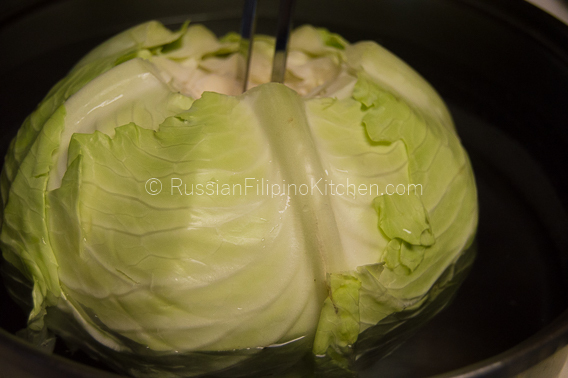 Tilt the cabbage from side to side to make sure the leaves are in contact with the water to soften them. 5. Use a tong to remove the leaves that came off or the ones that are soft enough. Arrange on a plate or baking sheet. 6. 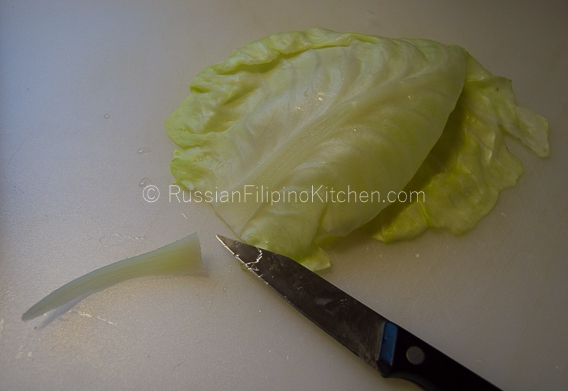 Remove the hard vein or stem in each cabbage leaf using a paring knife. For larger leaves cut in half along the stem. Set aside until ready to use. 7. Peel and chop onion until very fine. 8. Peel and chop carrots until very fine as well. 9. 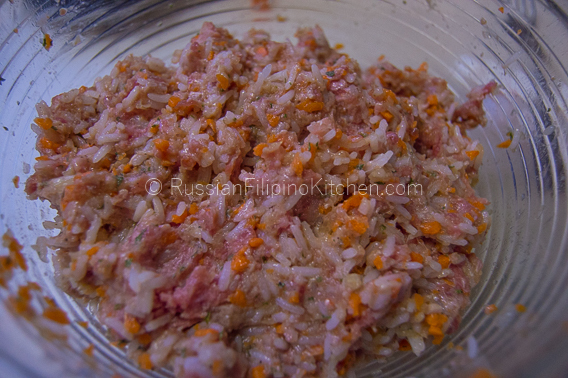 In a large mixing bowl, place ground beef, cooked rice, chopped onion, chopped carrots, egg, parsley, salt, and ground pepper. 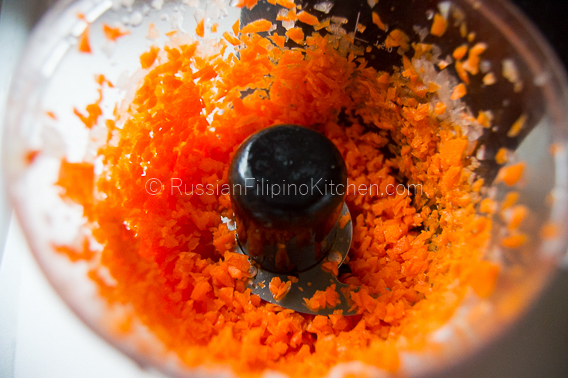 Mix thoroughly with a spoon (or your clean fingers). 10. 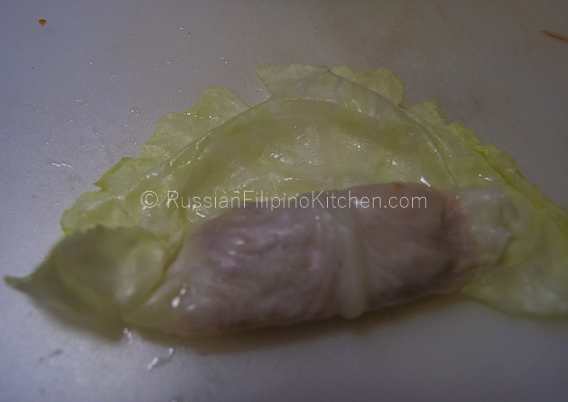 Lay one cabbage leaf flat with bottom end towards you. 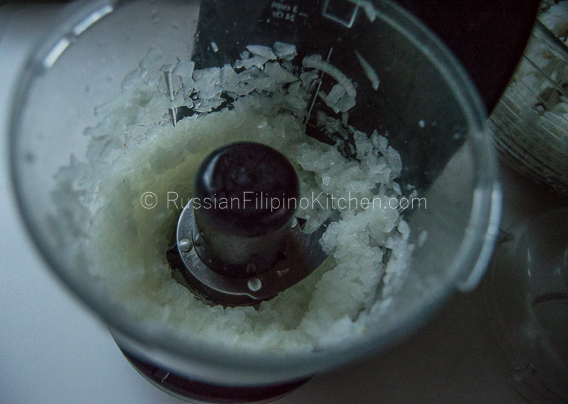 Place about ¼ cup of the mixture. 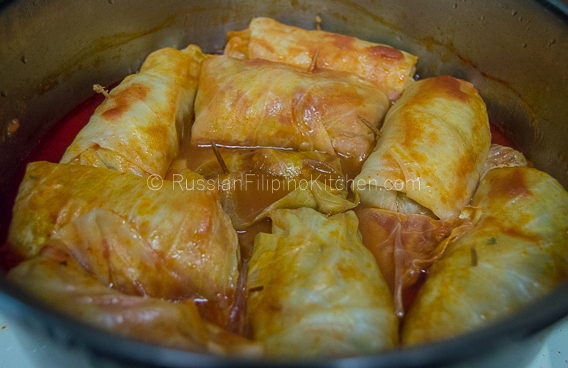 Roll towards the top, then about halfway fold the sides like an envelope and continue wrapping until you reach the top end. 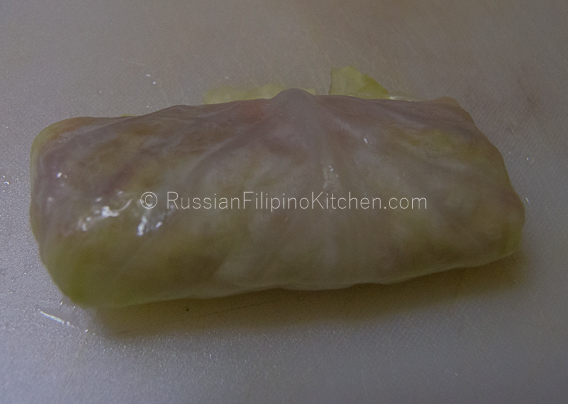 Insert a toothpick to seal the roll tightly (though not required, I just like to do this so the meat filling doesn’t leak into the sauce). Repeat until all the mixture is wrapped. 11. 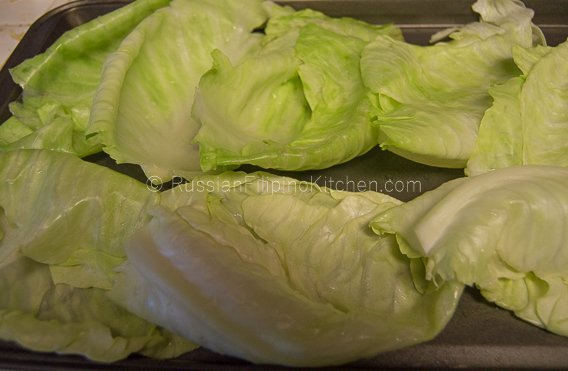 Arrange into a large pot (I use the same pot for softening the cabbage leaves. I just emptied the water out). 12. Place pot on the stove and set dial on high. 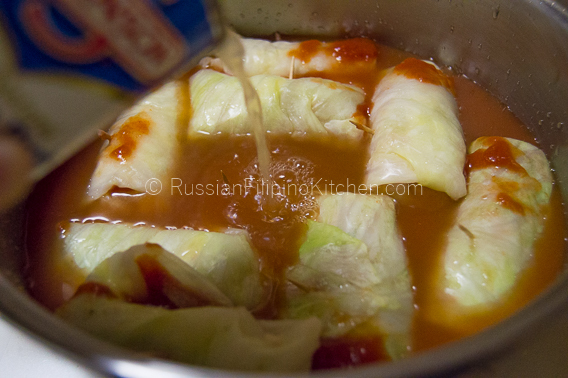 Add the tomato sauce and broth into the pot. 13. 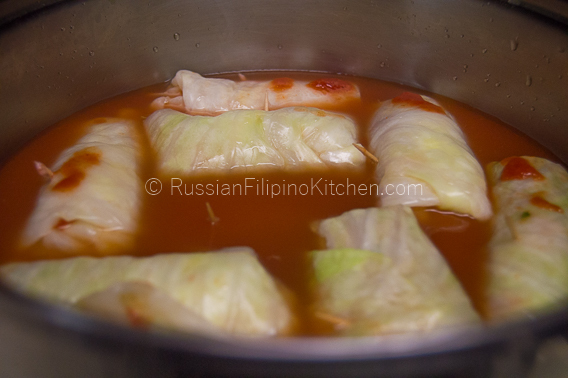 Bring to boil then lower heat to “medium low” and simmer for an hour with lid on. It’s ready when the sauce has reduced. 14. 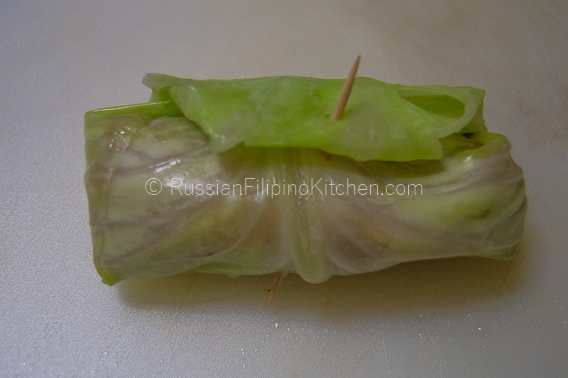 Remove toothpicks from the rolls before serving and top with sour cream if desired. Looks good! May give this a try. I make this for my wife, whose babushka used to make everything for the whole family gatherings. Her recipe includes a jar of plum jam put into tje stock 30 minutes before removing from the stove. We love this. I love Russian food. ? That’s an interesting spin to the recipe. I will try that next time since I have plenty of plum jams in storage. We harvested tons of plums from our backyard this summer. Thanks for the input, Mark!